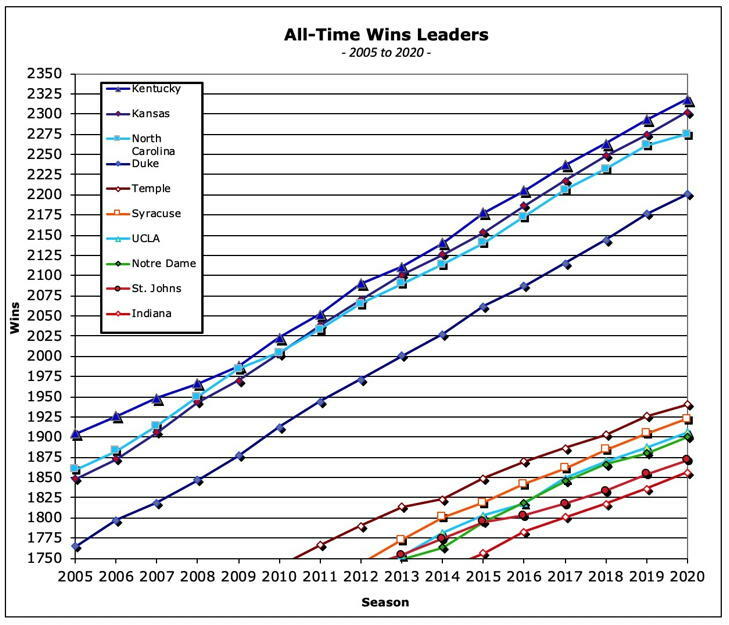 The race for all-time wins is one that is ever-changing, with no school having a monopoly on the lead, and with no assurance they will maintain their standing in the future. 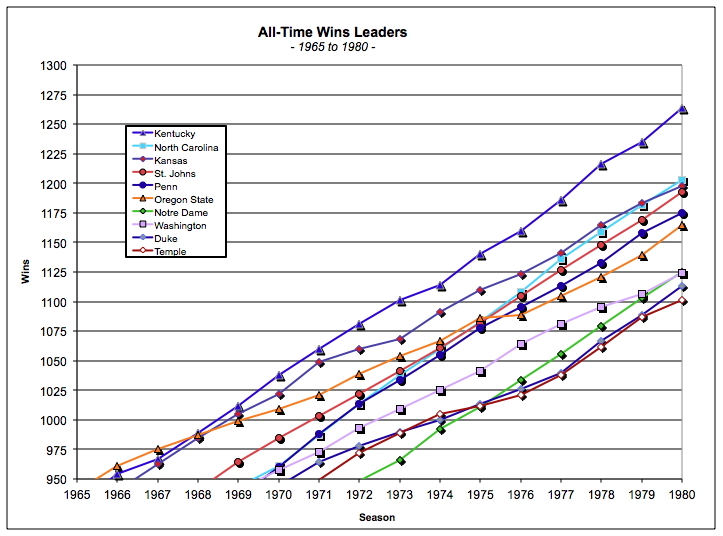 The graphs below were made from information provided by Mark Yakle and Gary Johnson (head statistician of NCAA basketball) along with assistance from Phil Porretta and Patrick Premo. For access to the detailed won-lost record for each school, please consult the NCAA website. 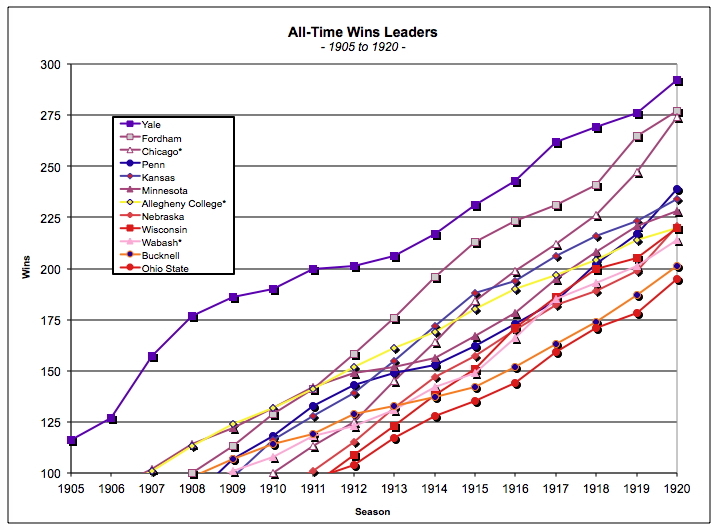 In addition, you can also consult this page for general NCAA trends of the current leaders, along with the following pages for the race to 1000 victories and the race to 2000 victories respectively. 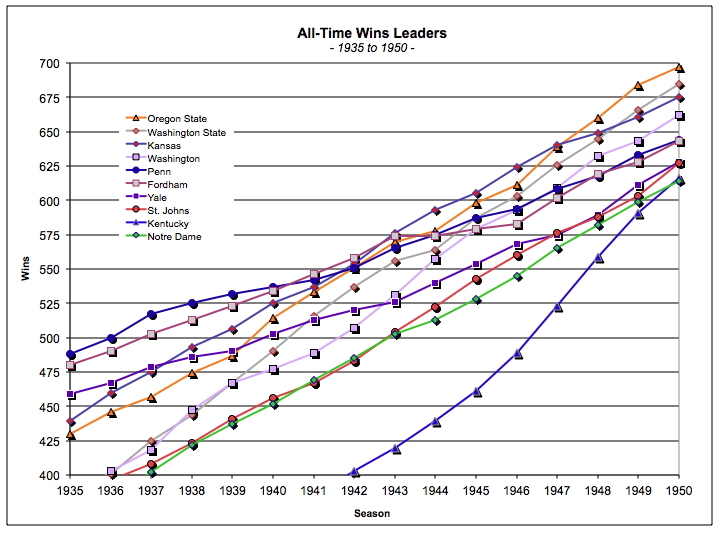 Most schools did not start playing basketball until after 1900, however some Eastern schools began playing before that. Temple was the first school to reach the 100 victory milestone although Yale soon took a commanding lead. 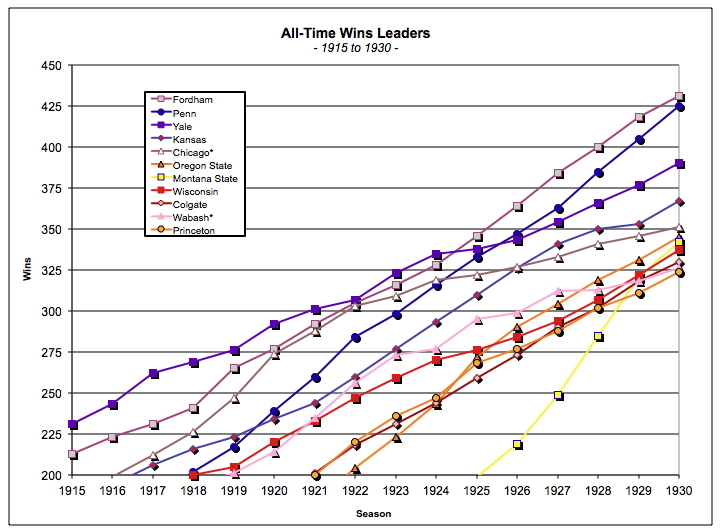 Note: Allegheny College, University of Chicago, Williams College and Wabash College are included in this chart as early leaders in all-time wins, although they currently do not compete in the NCAA Division I and thus are not considered in the official NCAA Division I records. Temple continues its swoon and falls off the chart while Yale, Fordham and Chicago vie for the lead. 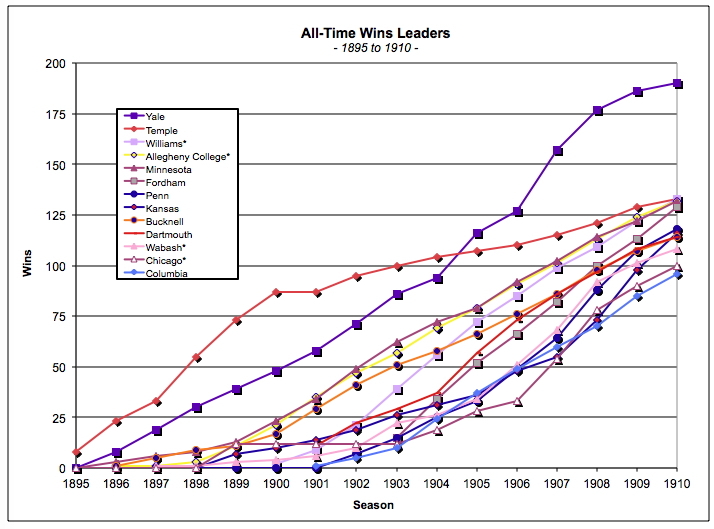 Penn and Fordham battle for the top spot while Yale drops into third place. Penn and Fordham continue to battle while Kansas sneaks into contention. Penn is the first to reach the 500 victory mark. 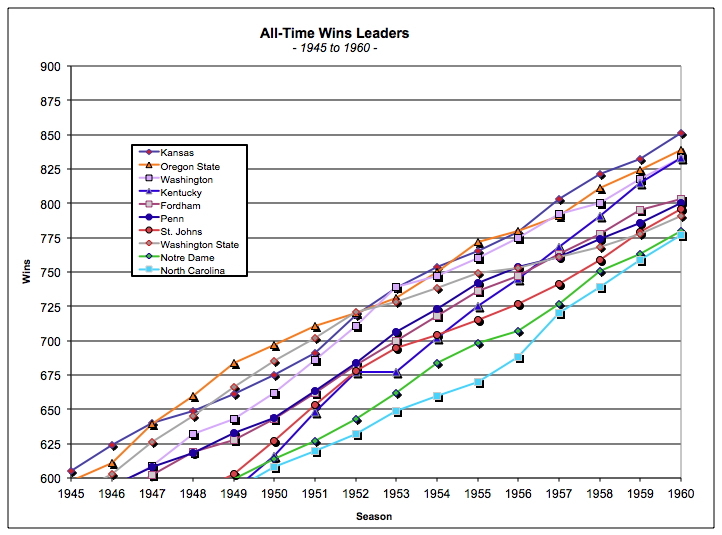 Oregon State takes the lead ahead of Washington State and Kansas while Kentucky comes out of nowhere to join the top-10. 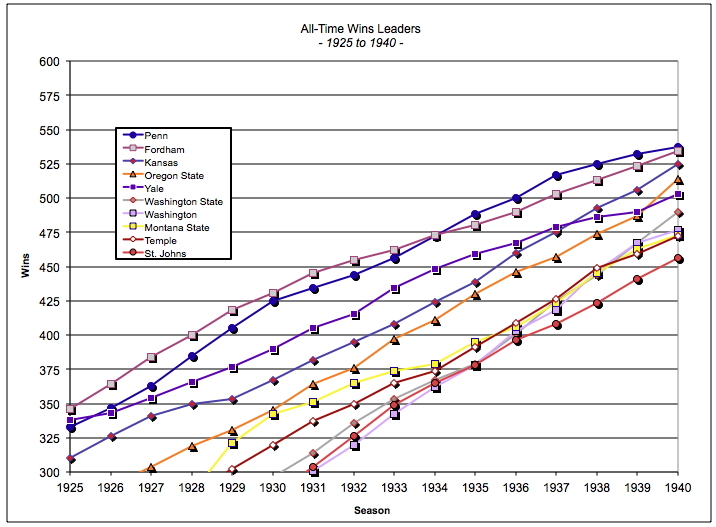 Oregon State and Kansas battle with Washington while Washington State drops out of contention. 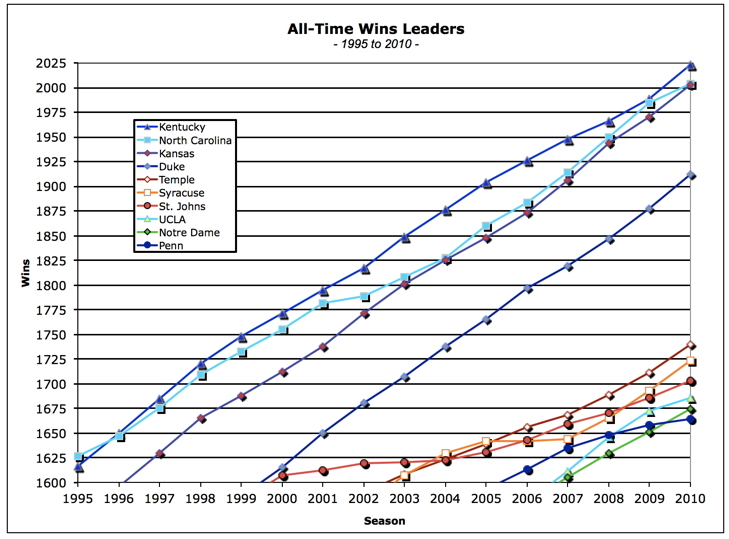 Kentucky, despite sitting out a season, makes a strong push. 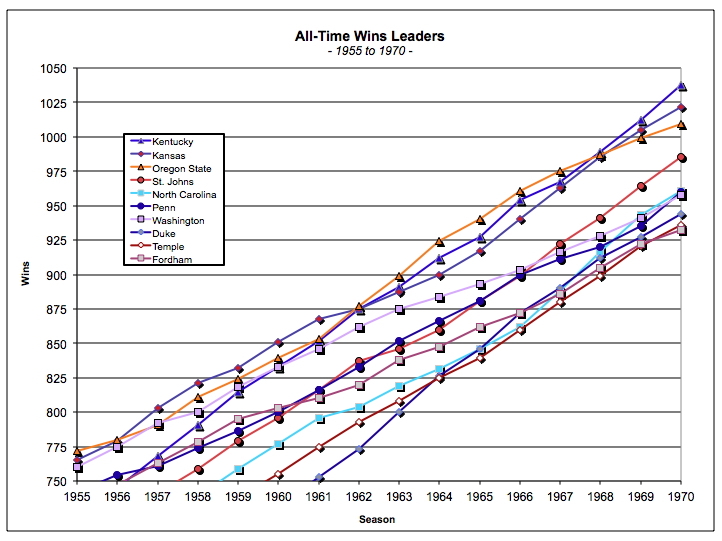 Kentucky is the first to 1,000 victories followed closely by Kansas and Oregon State. Kentucky widens its lead. North Carolina takes a steady course to move into second place. Kentucky falters near the end and battles with North Carolina for the top spot. Kentucky and North Carolina continue to battle while Kansas stays close behind. 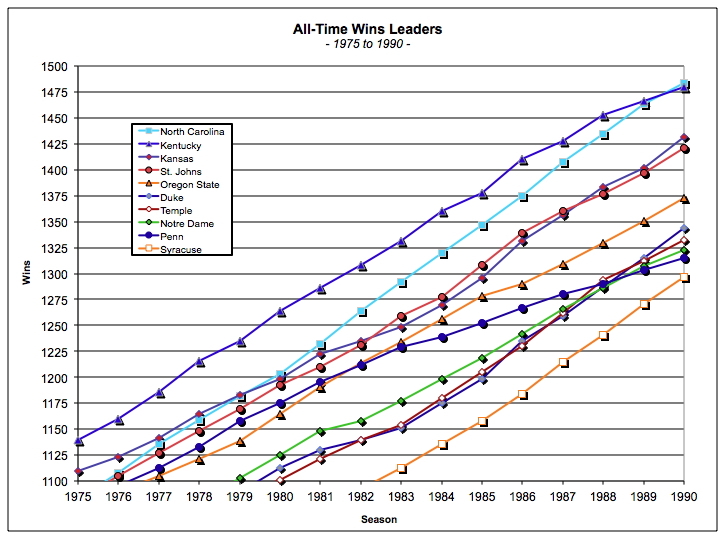 North Carolina takes the lead and is the first school to reach 1500 victories, before Kentucky reassumes the crown. Kentucky once again begins to falter but regains its form just in time to be the first to 2000-victories, while North Carolina tries to fend off Kansas. Duke keeps pace as it lurks in fourth place. 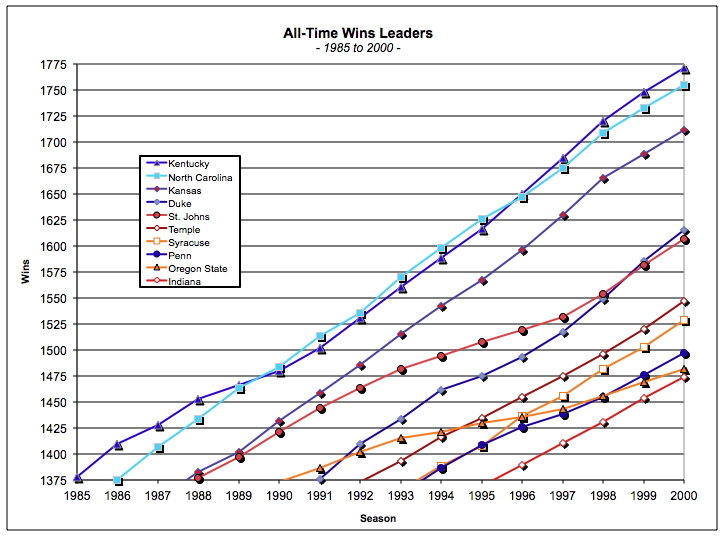 Current race sees Kentucky, North Carolina and Kansas in a neck-and-neck race for top honors. Acknowledgement: I would like to thank Gary Johnson of the NCAA along with Mark Yakle, Phil Porretta and Patrick Premo for their assistance in identifying early teams and providing statistical information. If there are additional graphs you would like to see or any comments or interesting findings you see in the graphs, feel free to with any corrections or additional information. Return to Kentucky Basketball page, statistics, team schedules, team rosters, opponents, players, coaches, opposing coaches, games, assistance or search this site.